I love cheese biscuits. I think they are right up there in my list of favorite things to eat. These biscuits are often also referred to as tea biscuits or baking powder biscuits. Whatever you want to call them is fine. Just make them! You will be thrilled that you did. Combine the flour, baking powder and salt in a mixing bowl. Cut in the shortening with a pastry blender until the mixture looks like coarse meal. Add the cheese and milk, stirring until the dry ingredients are moistened. Turn the dough onto a lightly floured surface and knead 8-10 times. Roll the dough to a 1/2 inch thickness. Cut the dough with a 2 inch biscuit cutter. Place the biscuits on an ungreased baking sheet. Top with a bit of extra cheese if you want and bake at 450°F for 12-14 minutes or until golden brown. Serve the biscuits warm or cold. They are great served with butter, especially while they are still warm. Grate some extra cheese and sprinkle it on top of the biscuits just before baking. The browned, baked cheese on the top really ups the flavor. If you really want something just a bit different, finely chop a bit of red pepper and add it to the batter before placing it into the baking pan. It adds wonderful color and pepper flavor. Or chop and add a bit of hot jalapeno peppers to your taste. The recipe calls for cheddar cheese and I think a strong cheddar is perfect here. You can use other cheeses though. They just need to be strong in flavor and not too wet. For example, neither cream cheese nor cottage or ricotta cheeses would work well here. 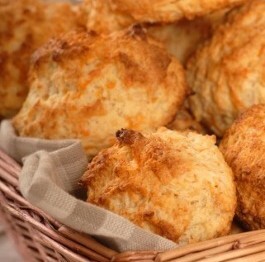 Biscuits are a perfect accompaniment to so many comforting foods – chilis, stews and soups for example. But they also work well paired with a salad for a light lunch, or on their own with a bit of butter and fruit for breakfast. Any way you eat them, this cheese biscuit recipe will delight you. They are tender, fluffy and tasty. Go for it and enjoy! 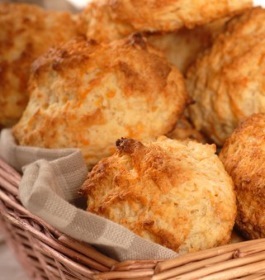 If you like this recipe for cheese biscuits, you may also want to try our mouth watering buttermilk biscuits. My family is always wanting me to bake these cheese biscuits.